Spring is in full swing here at Walt Disney World Resort. I don’t know what it is about this time of year, but it always inspires me to don my finest wardrobe items and step out in style. I’ve often seen guests in the Parks dressed up in a wide variety of themed attire, and those looks served as inspiration for a new Disney Parks Blog series dedicated to dressing up at Disney Vacation Club Resorts! 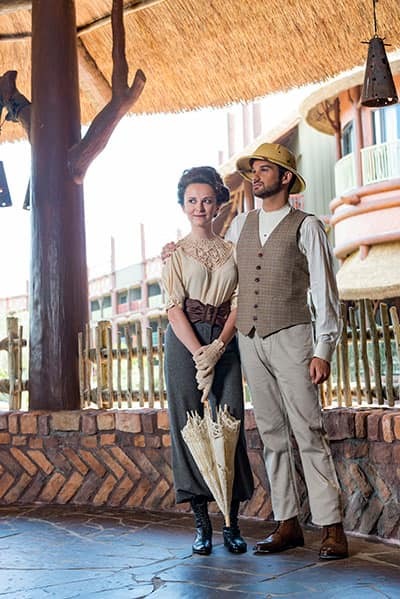 Each Disney Vacation Club Resort offers a unique theme, which offers the perfect setting for a day of dress-up fun. Today I’m sharing looks inspired by Disney’s Animal Kingdom Villas – Jambo House and Copper Creek Villas & Cabins at Disney’s Wilderness Lodge. First, this daring, adventurous look, snapped at Disney’s Animal Kingdom Lodge. These two look as if they stepped straight out of the legendary story of “Tarzan” While the color palate for these styles is nature-toned and muted, the details are anything but! Lacy elements add class and sophistication for the lady, while the gentleman’s rugged boots and hat mesh seamlessly with a distinguished tailored vest. All in all, this look is something I’d LOVE to recreate on a Disney Vacation Club stay at this Resort. 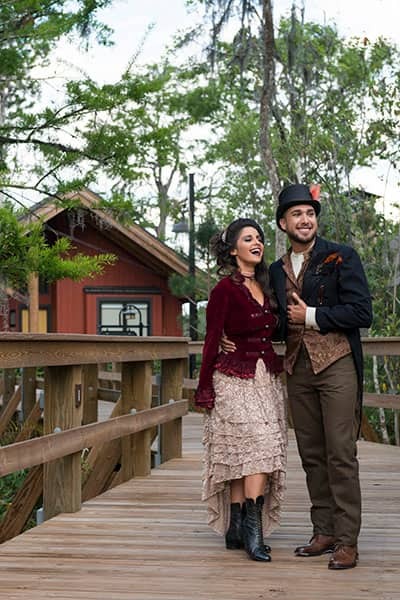 Next up: Dashing steampunk style at Copper Creek Villas & Cabins. 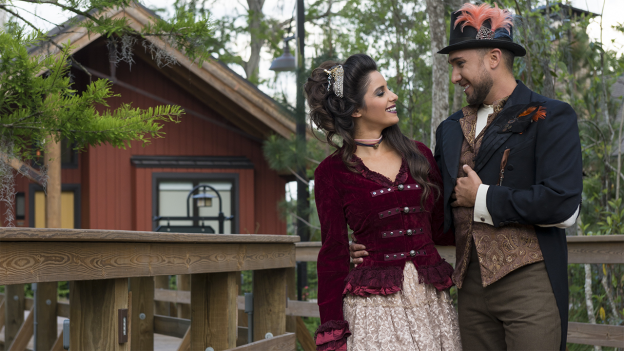 Inspired by the nods to America’s Transcontinental Railroad found throughout the Resort, this look is a whimsical take on turn-of-the-century style with a bit of modern flair. Rich burgundy, soft dusty rose and even pops of salmon bring color to these fashions, while also matching the stunning coloring of the Resort’s Cascade Cabins. These breathtaking looks are just the beginning! In future posts I’ll explore even more dressy looks inspired by other Disney Vacation Club Resorts. 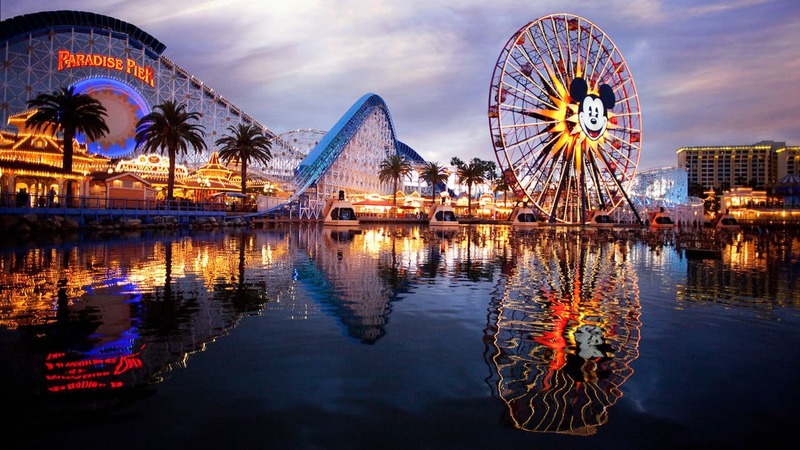 Stay tuned to the Disney Parks Blog for more in the weeks to come! It’ll be fun seeing what you have in store for the Grand Floridian and Poly….. I am so excited for this Blog Miss Amanda!! Thank you for doing this. We’re DVC members and now knowing people dress will make vacations more fun for us because we like to semi cosplay as well.